Field Woodrush (Luzula campestris) is noticeable in a lawn in early spring. 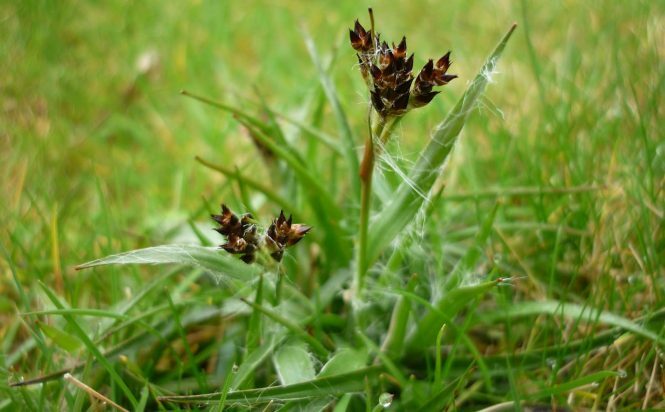 It can be easily seen as a patch of thicker-type grass, with hairy leaves that have tassel-like black and brown flowers protruding a couple of inches above the usual level of the lawn. It usually spreads in small patches, but can spread to a couple of metres across if left unchecked. Luzula Campestris is member of the rush (Juncaceae) family of plants. It is a perennial weed which, once it has made its way onto a lawn, spreads via slow creeping rhizomes or by seed if the flowers are not mowed off and are allowed to set. Woodrush is most common in acidic lawns. It is most happy where lawn thatch has built up, weakening the grass and lowering the pH. Field Woodrush can be controlled through an application of a weed-control as part of a regular treatment package, and I also recommend reducing the acidity through a pH adjustment treatment in the autumn. 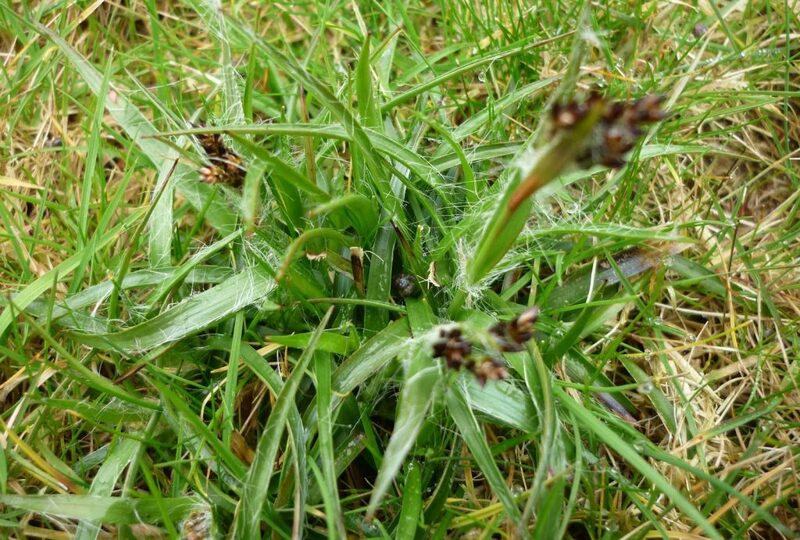 If you have a problem with Field Woodrush in your lawn, then get in touch. I will be happy to advise. This is not really a post. I would like to contact you about your super image of L.campestris here! You are welcome to use my photos. All I ask is credit given on the page and a HTML back link to the relevant post. Thank you. Would replacing with new turf get rid of this problem? It seems to be creeping all over my lawn. I will try and get the weedkiller you mention. Is there a brand you would recommend. This problem only seemed to appear after scarification in April. Don’t remember seeing the problem before this. Replacing the turf would get rid of the Woodrush. That is until it returns, which would be inevitable if it is uncontrolled in your area. I recommend getting your lawn treated professionally, as a licensed operator will have access to much wider range of chemicals to help with your situation which are not available to the public. How do I get rid of field wood rush? Woodrush is a tough one to get rid of. A weedkiller containing mecoprop-p, and liming in autumn is your best bet.